Over a period of just three and a half days, NBC, CBS and ABC have developed an insatiable hunger for the Herman Cain sexual harassment story, devoting an incredible 50 stories to the allegations since Monday morning. In contrast, over a similar period these networks mostly ignored far more substantial and serious scandals relating to Bill Clinton. Without offering facts, Ross described Cain's time as head of the National Restaurant Association: "It fits with the kind of culture we were told that existed there, with young women who had been, sort of, lobbyists for the restaurant association, working with various states. They were the new ones, the young ones. And they say that's where Cain often socialized." GMA's George Stephanopoulos trumpeted the latest: "Another woman. Herman Cain facing new allegations that he was aggressive and inappropriate to a third employee, inviting her back to his corporate apartment." "Is the pressure finally getting to the front-runner," inquired the former Democratic operative turned journalist. On the November 3 Today, Lisa Myers, with no sense of irony, declared the story "a feeding frenzy." She trumpeted, "For Herman Cain, this story is quickly going from bad to worse." Yet, on CBS's Early Show, Chris Wragge piled on, saying of a third possible Cain accuser, "That pretty much takes care of any hope he might have had to see this story fade any time soon." The nightly newscasts offered a similar tone. Both Evening News anchor Scott Pelley and Nightly News' Brian Williams led their shows by exclaiming, "Under pressure." Williams added, "Herman Cain fights to stay on his game as reporters swarm and questions swirl about accusations of sexual harassment. Tonight, one of his accusers wants to talk, but can she go public?" 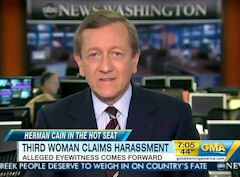 In a follow-up segment, Williams spun the story as a reminder of the seriousness of sexual harassment: "This, of course, is just the latest entry in a long list of similar situations, stories that have made headlines and come and gone over the years and a lot of people are wondering not only what really happened here but where the line is where the rules of the workplace are concerned." The morning shows, Good Morning America, Today and Early Show, devoted 12 stories to the scandal on Thursday. Wednesday's evening newscasts, Nightly News, World News and Evening News, offered another six. ABC's Nightline also had one. GEORGE STEPHANOPOULOS: Another woman. 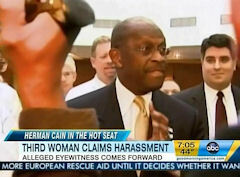 Herman Cain facing new allegations that he was aggressive and inappropriate to a third employee, inviting her back to his corporate apartment. Is the pressure finally getting to the front-runner? HERMAN CAIN: Excuse me. Excuse me! STEPHANOPOULOS: Now to the firestorm surrounding Herman Cain. A third woman is accusing him of acting inappropriately when she worked for him at the National Restaurant Association back in the 1990s. And an eyewitness to one of the incidents is saying that if the whole truth came out, it would sink Cain's campaign. All as the candidate is blaming the controversy on his rival, Rick Perry. So, ABC's Brian Ross has more all of this from Washington. This does not seem to be ending anytime soon. BRIAN ROSS: It does not, George. But overnight, one of the women who Cain said made a false accusation against him, has decided not to make a public statement to challenge his version of events. Her lawyers said that while she wanted to restore her reputation and challenge Cain, she did not want to become another Anita Hill and let this controversy take over her life. It was a little good news for Cain, on a day when there were new allegations from a third former employee, who also claimed inappropriate behavior. CAIN: Excuse me. Excuse me! ROSS: Cain has called all of the allegations false and questioned the integrity of the women who have made them. CAIN: I do recall that her performance, as had been told to me by her boss, was not up to par.ROSS: While the women were not named, they are well-known in government circles. One is now a spokesperson for a federal government agency in Washington. She is the woman who Cain said, misunderstood a simple hand gesture. CAIN: And I was standing near her. And I did this, saying you're the same height as my wife. ROSS: Another of the accusers is now a registered lobbyist in New Jersey, who friends thought Cain had gone too far, after she accepted an invitation to have a drink with him. Cain says that was also innocent. CAIN: It was never she and I alone or anything like that. ROSS: But a former restaurant association pollster says, he was an eyewitness at a restaurant in Virginia and that what happened to the women were very serious. Chris Wilson, now a supporter of Texas Governor Rick Perry, appeared on an Oklahoma radio station. CHRIS WILSON: She was a very lower level staffer. I think she was maybe two years out of college. And this all occurred at a restaurant in Crystal City. And everyone was very aware of it. And I don't want to be drawn into it, specifically, but if she comes out and talks about it, I think it will probably be the end of this campaign. ROSS: Cain's response to all the new allegations, Wednesday, was to blame Governor Perry's campaign for smearing him. CAIN: And we now know, and we have been able to trace it back, to the Perry campaign that stirred this up and brought it to discredit me, my campaign, and slow us down. ROSS: Overnight, Perry responded to Cain's allegations. RICK PERRY: There's not anybody in my campaign that knew anything about this that's associated with my campaign, in any form or fashion. I mean, end of story. We found out about Mrs. Cain at the same time everybody else did. ROSS: In fact, all of the campaigns have denied having any role in providing information for the original story. But behind the scenes, several of the campaigns are still urging reporters to continue to dig, George, saying, there's more to be found in the private life of Herman Cain. And as you know, presidential politics, always rough and tough. No less so this year. STEPHANOPOULOS: Yeah. This is just the beginning on this one. But, Brian, what do we know about the third woman who has come forward to the Associated Press? Doesn't want her name out there. But she is also saying that she considered filing an action against Cain, as well. ROSS: She was one of a number of women who worked in an area where they often went out for drinks with Cain after work. The description we've had is that he asked her up to his corporate apartment. It fits with the kind of culture we were told that existed there, with young women who had been, sort of, lobbyists for the restaurant association, working with various states. They were the new ones, the young ones. And they say that's where Cain often socialized.